Could you identify these pollinators? A brand new, free, online course launches in March 2018. ‘Keep Edinburgh Buzzing’ is a joint venture between the Royal Botanic Garden in Edinburgh (RBGE), Edinburgh Living Landscape (ELL) and the Royal Zoological Society of Scotland (RZSS) with the support of Butterfly Conservation Scotland. It’s full of useful resources about how everyone can play their part in conserving pollinating insects. The course has been designed by the Online Learning Team at RBGE, written by the partner organisations and includes specially created videos kindly funded by the Sibbald Trust. It has two main aims – to raise awareness of the extent and importance of Edinburgh’s pollinating insects and to set a challenge for people living in Edinburgh to do their bit to help. This might be designing a garden or balcony to include the right plants to attract pollinators or getting involved in local initiatives – along with having fun identifying different bees, butterflies and moths! Jane Robertson (Online Learning Manager, RBGE) and Leonie Alexander (ELL Project Officer) were already keen to create an online course to encourage people to develop green spaces in Edinburgh and after meeting education colleagues at an RZSS Education networking meeting, ‘Academics Go Wild!’, this more collaborative idea came about. The Royal Botanic Garden Edinburgh is a lead partner in the Edinburgh Living Landscape project which was established to improve urban green space to benefit human health and biodiversity. This course is one of the ways that RBGE is developing the partnership while also highlighting the use of the Garden as a biodiversity and pollinator hotspot. 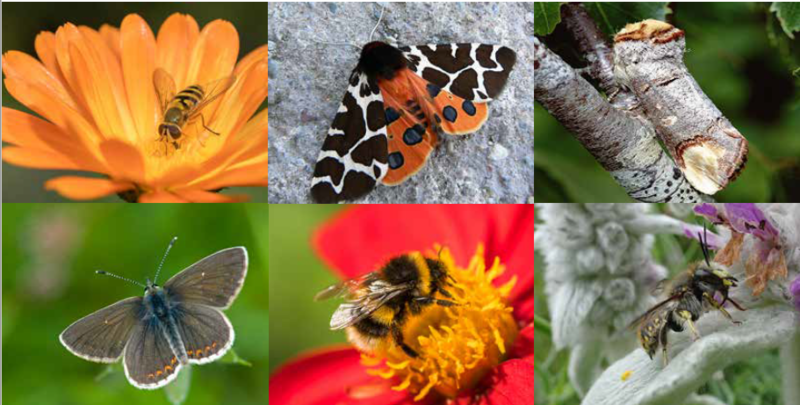 One of the exciting initiatives being undertaken by Edinburgh Living Landscape is the Urban Pollinator Pledge which aims to boost numbers of bees, butterflies and other pollinating insects within Edinburgh. At the end of the course, learners will be encouraged to ‘Take the Pledge’ – their promise to make a difference. The course is freely available from March 2018 through RBGE’s online learning environment, PropaGate Learning, and the RZSS website. Please take a look by going to https://onlinecourses.rbge.ac.uk/index.php/courses/keep-edinburgh-buzzing. We hope it motivates you to ‘Take the Pledge’ – and please pass on this link to others!